Prime Minister Justin Trudeau was already in a mess of trouble over the SNC-Lavalin scandal. But today’s news made it even messier as Jody Wilson-Raybould, the former attorney general who has been at the the centre of this developing controversy, announced she was resigning from her cabinet position as Veteran’s Affair’s minister and, perhaps more ominously, that she’s lawyering up. “I am aware that many Canadians wish for me to speak on matters that have been in the media over the last week. I am in the process of obtaining advice on the topics that I am legally permitted to discuss in the matter and as such, have retained the Honourable Albert Cromwell, CC as counsel,” she said in a statement. This is not the kind of news Trudeau or the Prime Minster’s Office wanted to hear. Already scrambling to refute allegations that somebody in the PMO had pressured Wilson-Raybould to intervene in the fraud charges against the Quebec-based engineering firm SNC-Lavalin, a beleaguered Trudeau told reporters yesterday that his office hadn’t pressured the former attorney general. He went on to say that he welcomed an investigation by the Conflict of Interest and Ethics Commissioner Mario Dion to look into the affair. The investigation will apparently revolve around whether the government violated Section 9 of the Conflict of Interest Act, which prohibits a public office holder from seeking to influence a decision of another person so as to improperly further another person’s private interest. Unfortunately for Trudeau, that escape-route no longer applies. 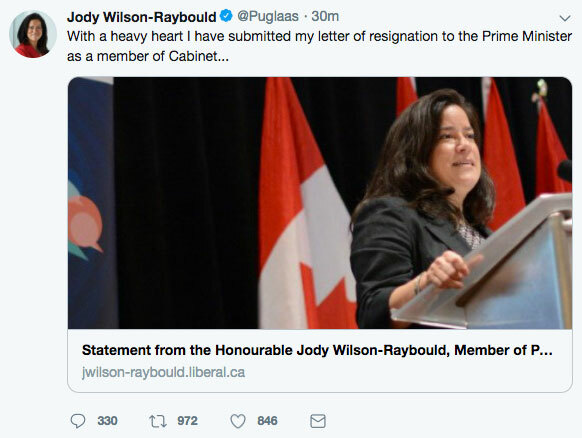 Now that Wilson-Raybould has resigned from cabinet, she isn’t bound by the client-attorney privilege. Presumably, she’ll now be able to tell her side of the case. And that’s a huge blow for Trudeau and the PMO, if indeed they were covering up the affair. 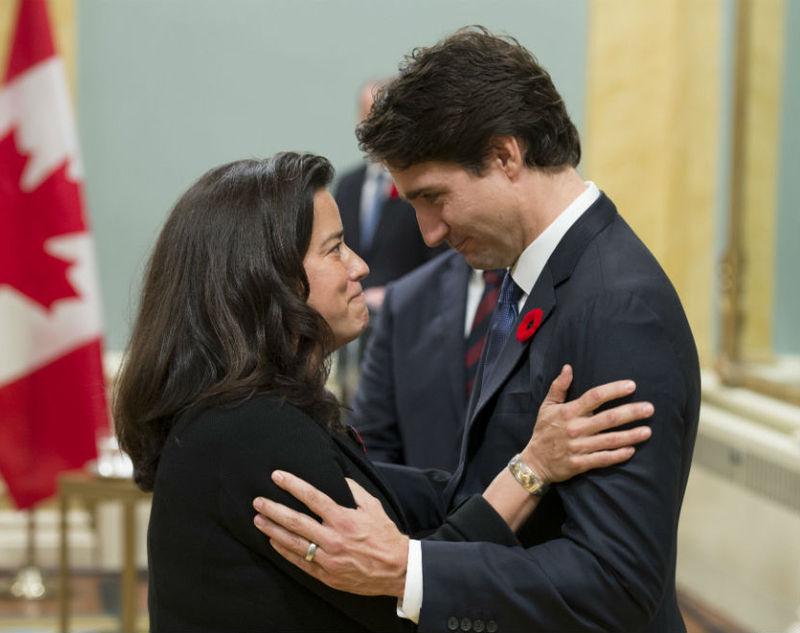 The whole Wilson-Raybould affair has had a bad odour to it right from the moment Trudeau announced that she was being shuffled from attorney general’s portfolio to veteran’s affairs, a move which was seen as a demotion. Wilson-Raybould was the epitome of Brand Trudeau—the daughter of a First Nations politician, she was a lawyer whose sterling career as Crown Prosecutor and Regional Chief of the B.C. Assembly of First Nations paved the way to her becoming justice minister. She was the perfect fit for his new cabinet. Yet three years later she was unceremoniously demoted, shuffled off to Veteran’s Affairs. Many were puzzled by the fact that the Prime Minister never clearly explained what she had done to deserve the demotion. How had her star fallen so precipitously in such a short time? Trudeau’s failure to answer that question is undoubtedly why so many people are now jumping to the conclusion that it was somehow related to her refusal to bow to pressure and intervene on behalf of SNC-Lavalin. So with the government’s legitimacy swaying in the balance, the whole country is waiting for Wilson-Raybould to finally tell her side of the story. Who says Canadian politics are dull?